What makes you unhappy about your smile? A single issue, such as mild discoloration, can often be improved with one treatment. However, if you have multiple concerns, then a combination of cosmetic dentistry treatments may be the best way to achieve the results you really want. 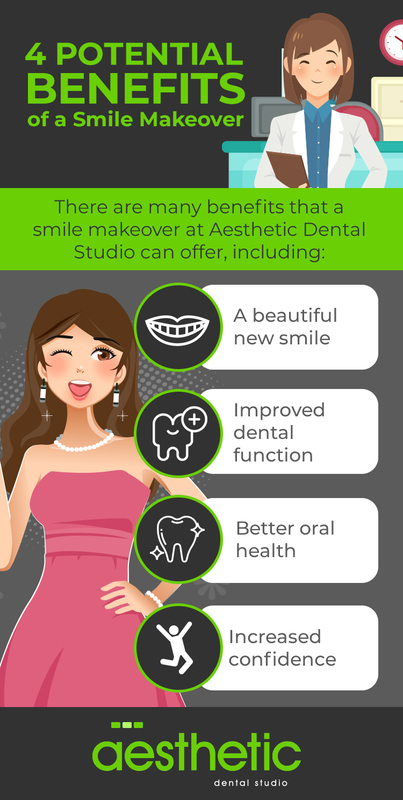 At Aesthetic Dental Studio, we offer smile makeovers to correct a wide variety of dental issues and create the smile of your dreams. Contact us at 587-315-5080 for your free consultation. Dr. Gordon Chee and his staff work with patients from Calgary, Cochrane, Airdrie, and nearby areas of Alberta. A smile makeover is a cosmetic dentistry treatment plan that uses both cosmetic and functional procedures to restore and improve your smile. Since a smile makeover is a uniquely customized process, the procedures that are included depend on the concerns that you want to address. Ultimately, a smile makeover creates a beautiful balance between every aspect of your smile while complementing your facial structure. A smile makeover won’t necessarily involve all of the procedures listed above. You will work with Dr. Chee to develop a plan that can help you achieve your aesthetic goals. These procedures are not performed all in one visit either. Instead, they will be spread out at a pace that fits your lifestyle and needs. Sometimes, one or two cosmetic treatments are all it takes to achieve the results that you desire. However, people who have multiple cosmetic issues can often benefit from the transformative effects of a complete smile makeover. Dr. Chee can help determine if you are a candidate for a smile makeover during your free consultation. A thorough dental examination is the first step to a more beautiful smile. During the consultation, you will discuss your goals, expectations, and desired outcome to determine how your new smile will look. Before cosmetic work can begin, any outstanding dental health issues must be addressed and corrected. When the function of your mouth, teeth, and gums is in good shape, Dr. Chee is ready to move on to the “beauty” portion of enhancing your smile with cosmetic dentistry. Dr. Chee will explain your options and discuss what procedures can help you achieve the smile of your dreams. We also use Digital Smile Design in our office to plan and create stunning smiles, and this technology may be used as part of your smile makeover. We can show you an idea of what your final results may look like using a digital wax mock-up. For more information, see our Smile Makeover Questions. To view the smile makeover results of our actual patients, see our smile gallery. If you would like to learn more about smile makeovers in Calgary, Alberta, please contact the Aesthetic Dental Studio online or by phone at 587-315-5080 today to schedule your initial consultation.